Have you ever thought to yourself while riding a bike “Gee, I sure wish that I could cross that river.” Well now here’s your chance! 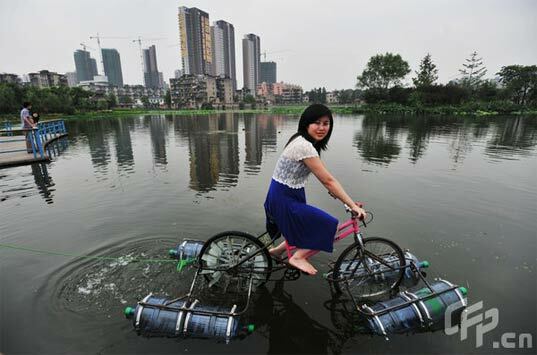 Li Wieguo has come up with a relatively cheap and practical DIY project that lets you modify your bike to make it float and work on water. Sure beats taking a boat. 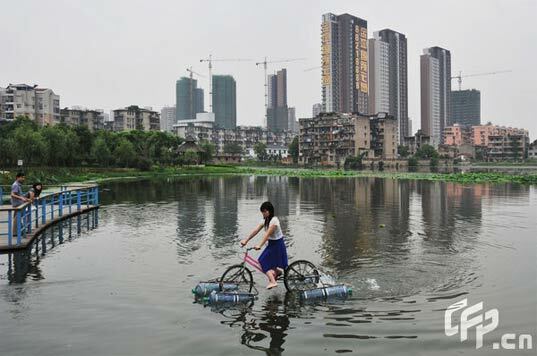 The alternative mode of transportation was shown off at the Naishahu Park in the province of Hubei in China and works by attaching eight water gallons to a metal frame attached to the bike. The wheels have been outfitted with paddles which allow it to maneuver. When the bike is on the road, the water gallons are raised, making it suitable for the street. Li Weiguo spent around 20,000 yuan (around $3,000) to develop the bike and is currently trying to refine his design and is looking for a manufacturer to mass produce it.